Bring a little nostalgia to your Valentine’s Day Candy with these retro treats! 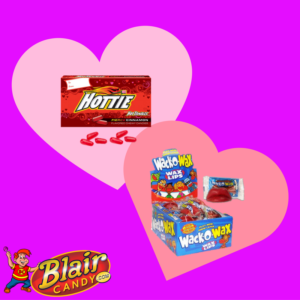 Blair Candy already stocks a variety of classics, so it’s only natural we have some for a day filled with love and candy – Valentine’s Day! Try the Wacko-Wax lips for a perfect pout. This bulk pack is perfect for Valentine’s parties! Or try the Tootsie Roll Chews! They’re in flavors just for Valentine’s Day and will add a bit of color to your candy display. Or, just share a treat with the one you love with these Hot Tamales. But be careful, they’re a little spicy! No matter what you’re looking for when it comes to Valentine’s Day, BlairCandy.com has what you need! From nostalgic treats to bulk candy, you can count on us to help you with your sweet tooth!